Hello & yet again, it’s FRIDAY! I can’t believe I’m nearly at the end of my home tour, the final two rooms are our master bedroom & then next week our ensuite bathroom. Hopefully it’s helped those looking for where things are from & some interior inspo. 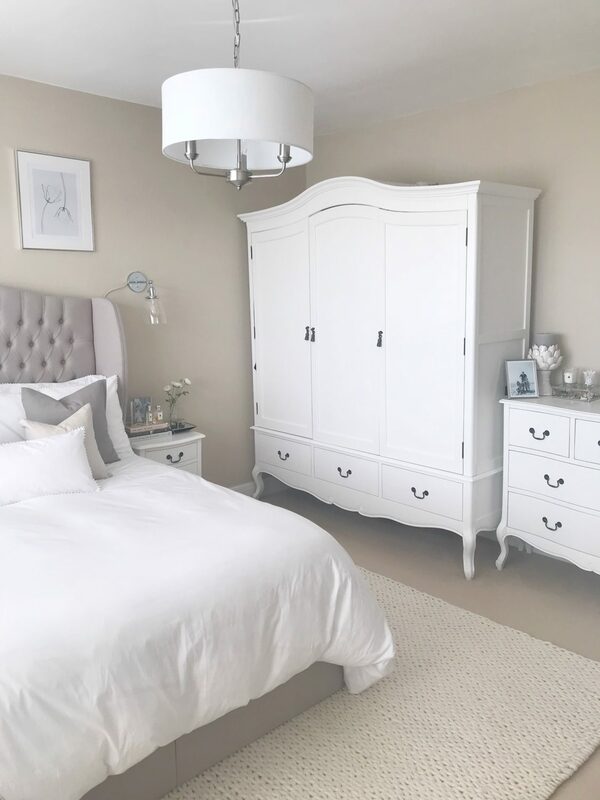 This room is one of my favourites since undergoing a bit of a mini makeover a few months ago with a new bed & a change in accessories. 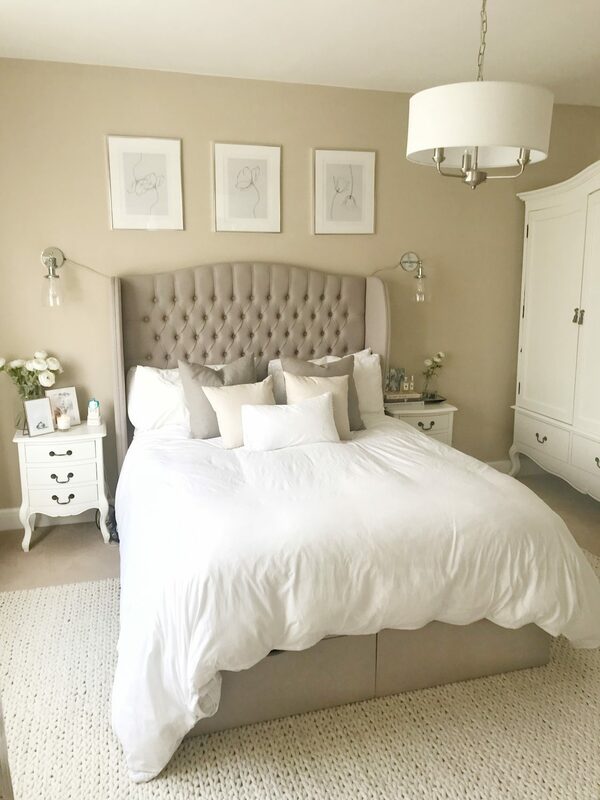 I believe that your bedroom is one of the most important rooms in design; it should be the space you go to to unwind & relax, a tranquil clutter free zen. The walls are painted in Wilko’s own brand paint in ‘Coastline’ which I’ve also bought across to the panelling in adjacent ensuite & is also in my office downstairs. It’s a beautiful calming colour. 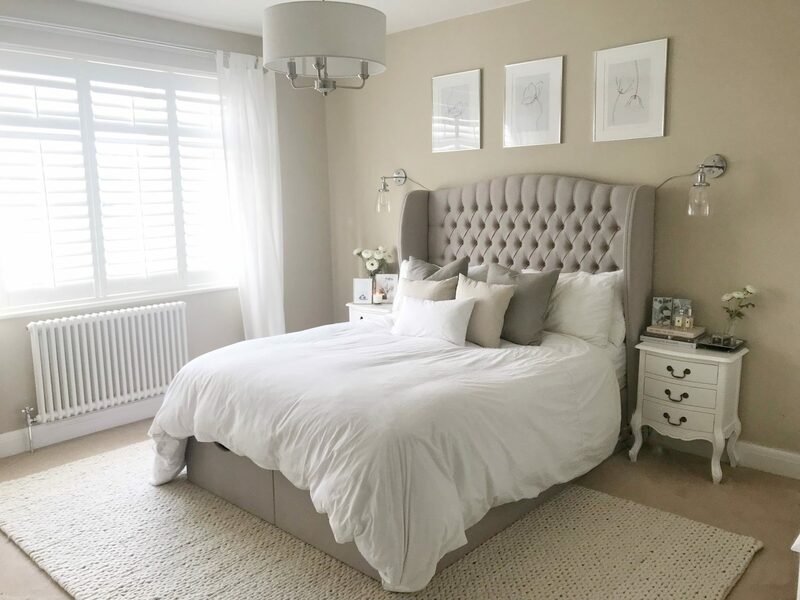 As with any bedroom, the main piece of furniture is the bed & this beauty is an upholstered buttoned winged headboard with ottoman base. The extra storage space for clothes & bedding is brilliant. The bed was from Luxury Beds Online which is the Chelsea in ‘Putty Linen’ plus I paid extra for the 150cm height, however unfortunately recently I’ve heard a few worrying reports of awful customer service & delivery (which I had problems with but assumed/was reassured was a one off..) from followers so please, approach with caution. Bedding is part of the Avignon collection from The White Company. 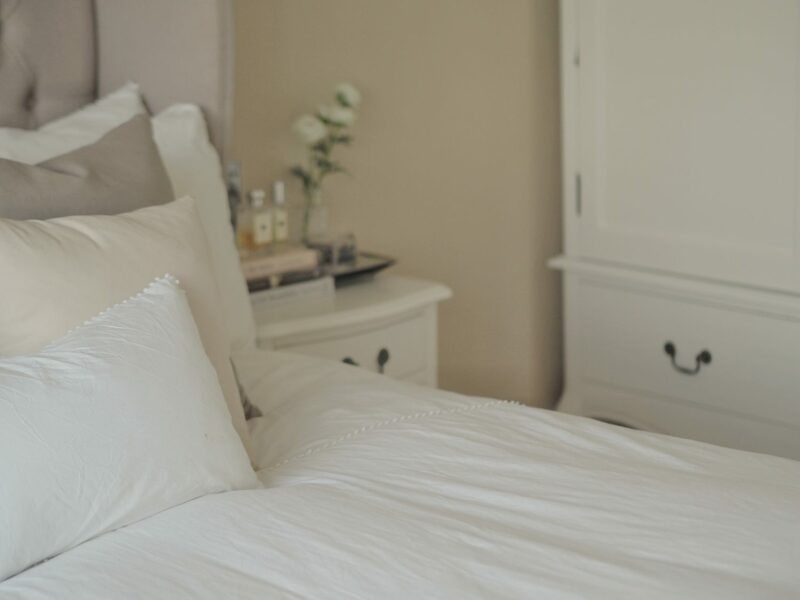 I love crisp white super soft & quality bedlinen for that hotel feel. It has little pom poms running across & on the pillow cases for detail. The cushions are H&M but I can’t seem to find them online. Above is three framed prints from Desenio, one of my favourite brands for find stylish yet affordable art work. The prints are the line poppy 1, line poppy 2 & line tulips at 30x40cm, all in silver 40x50cm frames with mounts (or as they call them, passe-partout). 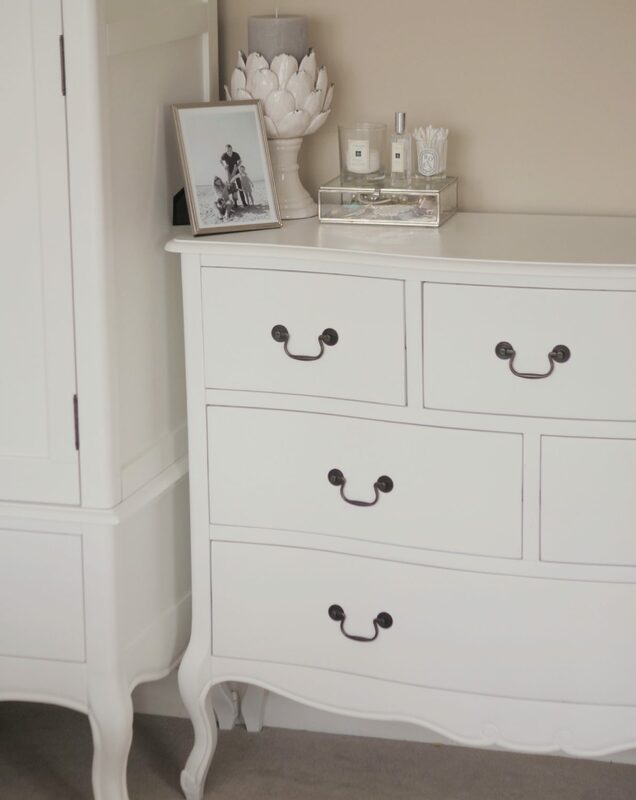 Either side of the bed are two bedside tables which match the triple wardrobe & chest of drawers. You can find them all through Ebay here. 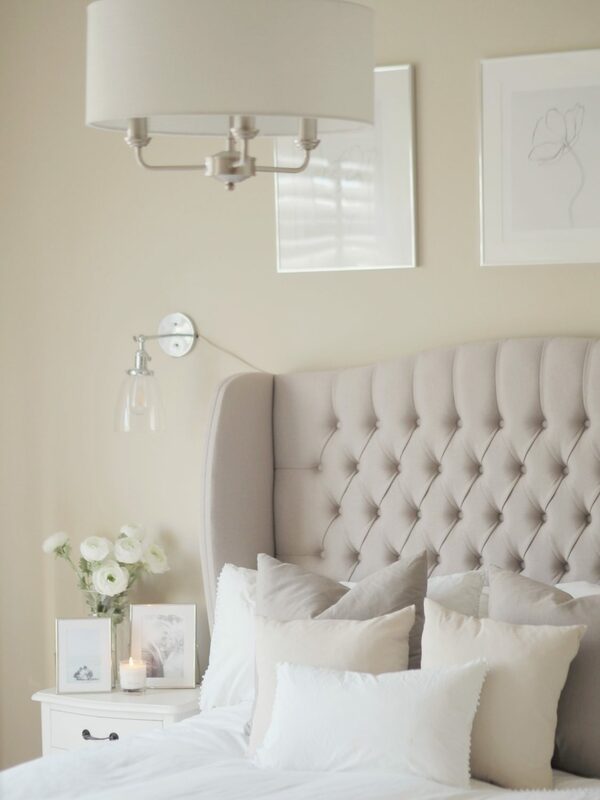 Above are wall lights rather than the typical bedside table lamps to free up a bit more space (for vital styling…obviously). To save money we found these wall lights on Amazon (plus light bulbs here) which are plug in & just painted the wire which runs behind the headboard rather than paying an electrician then having to have it replastered/painted. They look super stylish & it gives it that boutique hotel feel. 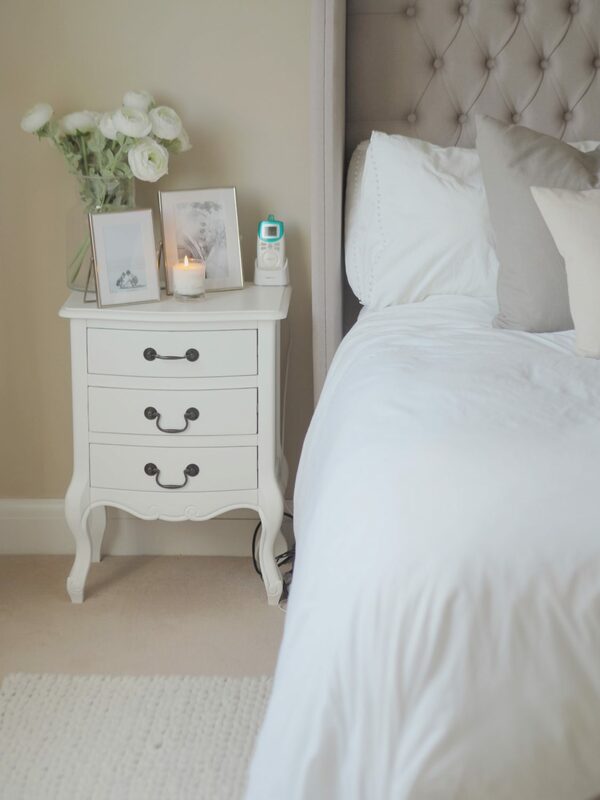 The left bedside table (Joe’s ‘side’…does everyone have sides?) 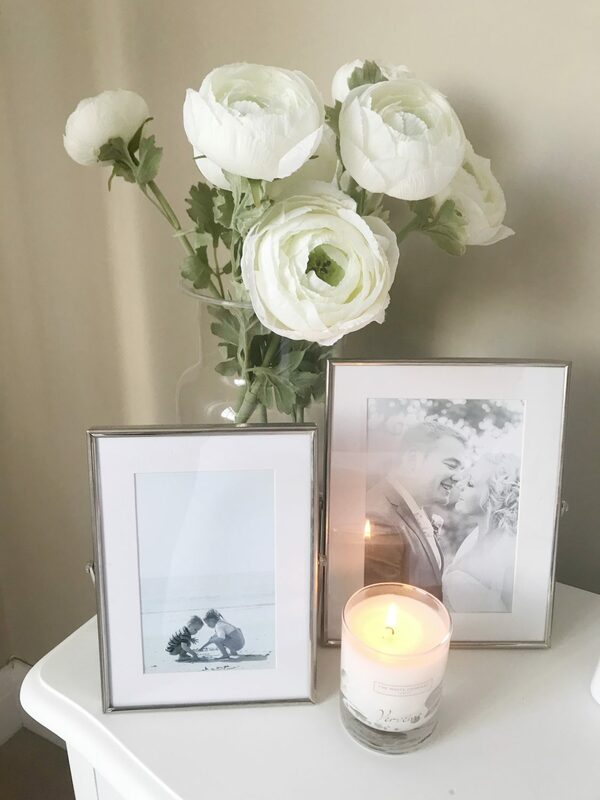 is styled with these The White Company silver easel frames, a glass vase from Amazon & some beautiful artificial ranunculus from Brissi although unfortunately these have been discontinued & are no longer on their website along with my favourite The White Co candle scent, Verviene. My side has some interior design books including ‘Living Life Beautifully‘ by Cristina Strutt (all about the Cabbage & Roses empire), ‘The Natural Home‘ by Hans Blomquist & ‘Mad About The House‘ by fellow interior blogger Kate Watson-Smith. Then are my favourite perfumes, Jo Malone ‘Peony Blush Suede‘ & ‘Orange Blossom‘ as well as a frame from Homesense. To the right is a little silver trinket tray, also from Homesense, a small vase of artificial rannucular, again Homsense (sorry!) & finally the smaller hexagonal jewellery box from The White Company. 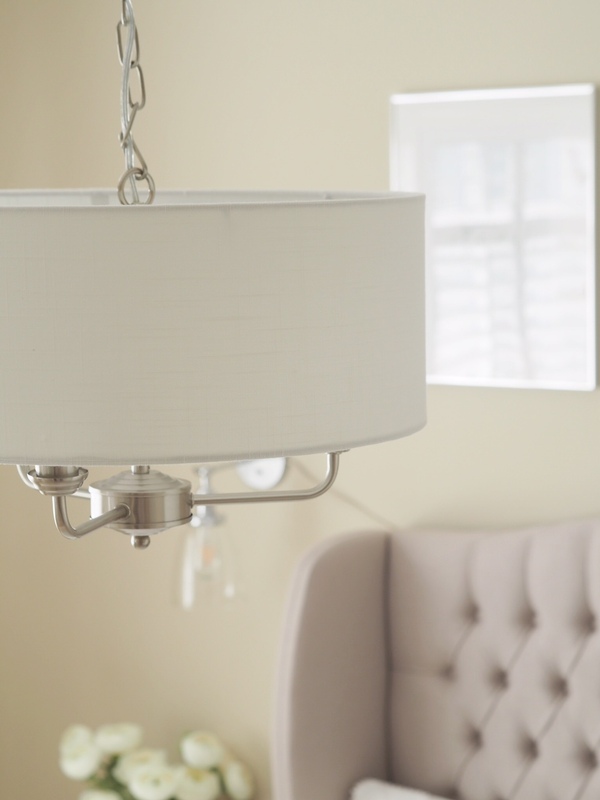 The light fitting is from Wayfair & is the ‘Grantham’ in Satin Nickel available here. I actually have the same downstairs in the living room but loved it so much (& it’s super good value for money) that I decided to get one for up here too. 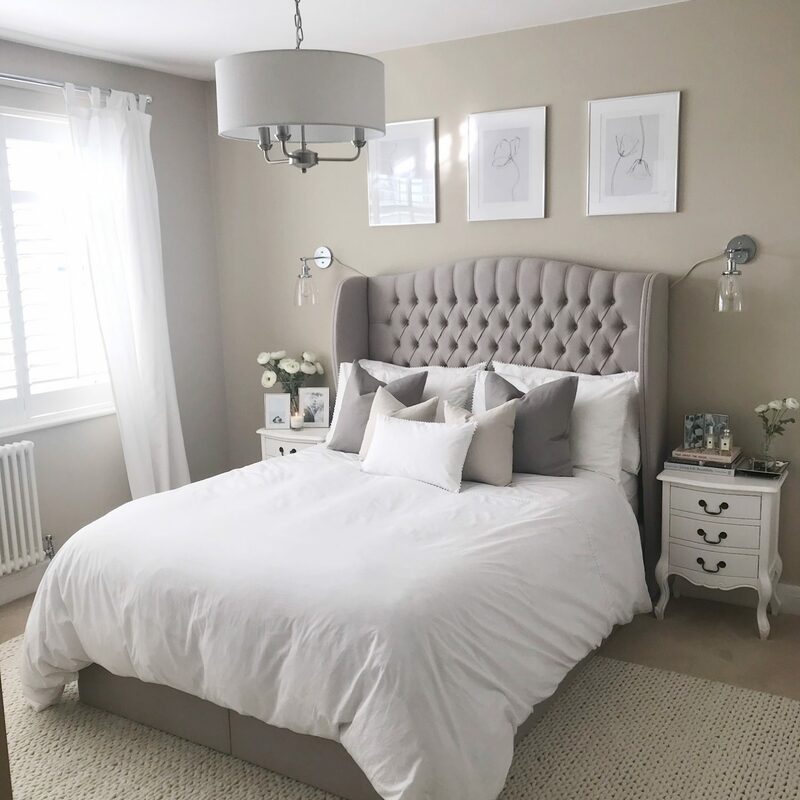 I talked about how rugs can bring so much to a room design over in this blog post (plus see advice on placement & so on) & this huge 2x3m ‘Ivory Fusion’ rug is from Modern Rugs. It’s super thick & soft so makes dragging yourself out of bed in the morning just that tiny bit more tolerable with that to to sink your feet in to. They generously gave me a discount code with no expiry so you can get 15% off using ‘Charlotte15’. Over to the window, the shutters are from California Shutters & curtains are cheap Ikea LENDA which soften the look & give it that cosy feel. 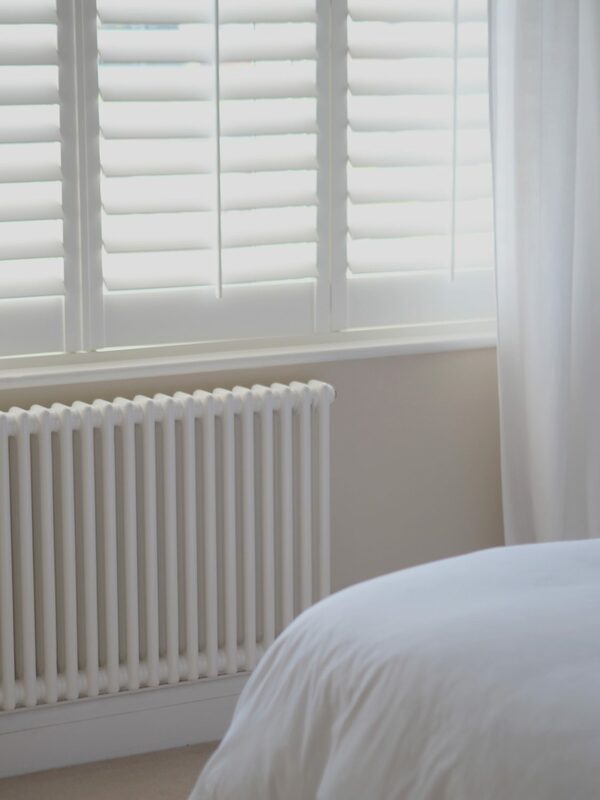 Below is the most beautiful radiator you ever did see (of which I’ll soon be swapping our ugly ones over to within time) which is part of the Milano Windsor collection of traditional style radiators from Best Heating. With the redesign, I also added in a large full length mirror. 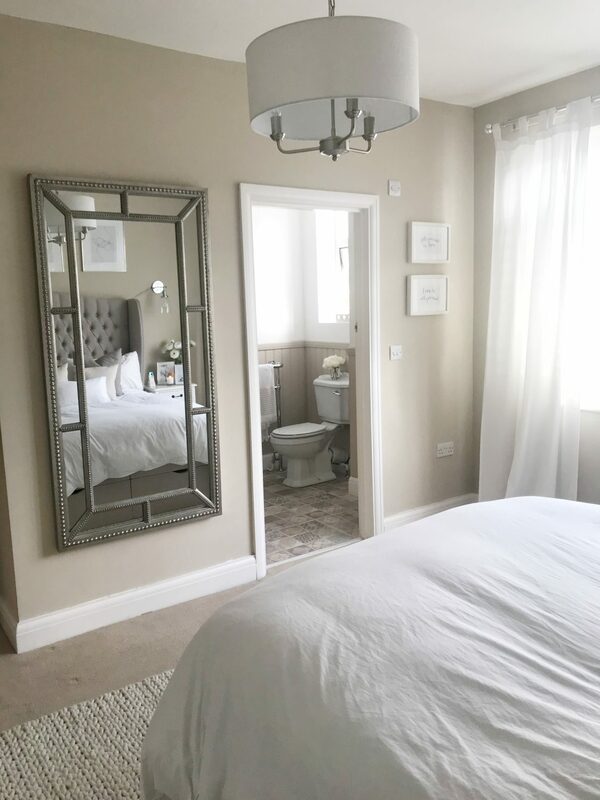 As many of you would have read in last weeks ‘The Diet That Made Me’ blog post, this was a revelation for me as despite constantly raving about the benefits & using mirrors within interiors I didn’t have a single one in my house, purely because I didn’t want to see myself! 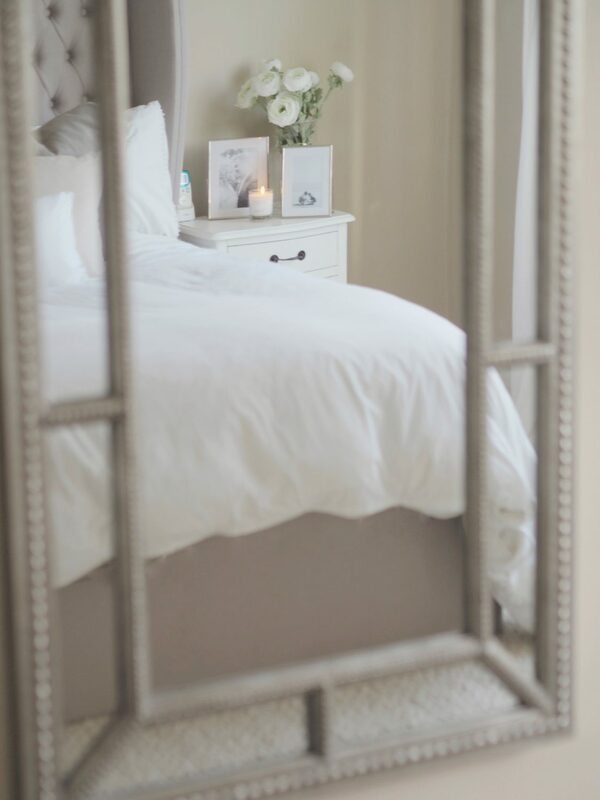 This is the gorgeous Lawson mirror which you can find on Ebay here. It has beaded detail which ties in beautiful with the pom pom bedding. 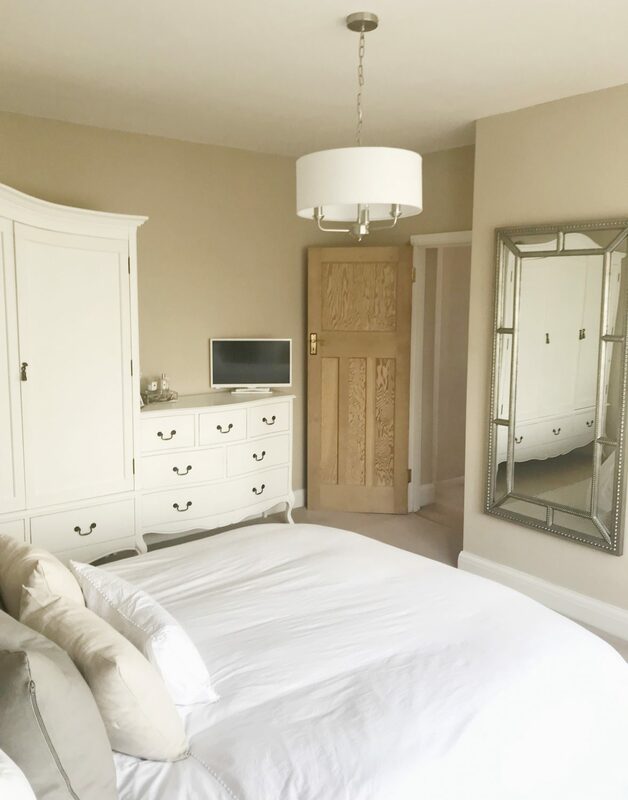 Finally over to the chest of drawers area which sits a white 24″ JCV smart TV, probably as pretty as a TV can get & although typically I’d say not to have a TV in a bedroom for many reasons….we like our tacky series & sometimes it’s nice to chill out in bed after a long day. To the left I’ve also styled with a silver photo frame (this was a Homesense find, sorry! 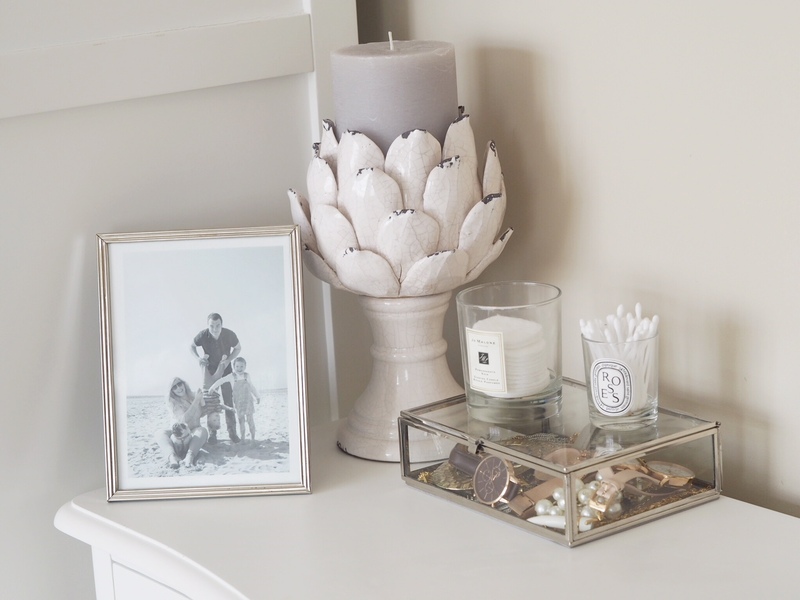 ), this gorgeous artichoke candle holder from One World as well as the most beautiful jewellery box to keep all my necklaces & watches in from The White Company. I’ve used these empty candle jars (see my blog post here if you want to know how to wash them out) to hold cotton buds & pads too. Next week will be my final Home Tour Friday post but until then, have a fabulous week ahead! Wow, it looks absolutely lovely! The pictures really show it off. How do you find Wilko paint? I’ve never been sure of how well it will work but it’s a great option for those decorating on a bit of a budget. looks so so Nice Charlotte, always so crisp and fresh looking. you cant imagine waking up in a bad mood with this room! the bed is amazing! i would be inclined to look at their range but not with the bad customer services. I have experience enough over the years. looking forward to the Van reveal!